Sara Chaidez, Licensed Esthetician with over eight year of experience devoted to proving the highest quality skincare treatments. As a licensed skin specialist, Sara, has received advanced training in skin analyses, procedures and treatments. New patients are evaluated using state-of-the-art skin scoping technology to asses for visible and underlying skin conditions. Hydrate, lift, and tighten your skin with our one of a kind oxygen facial. This skin quenching facial delivers instant and dramatic results using cooling, calming, pressurized oxygen with hyaluronic layering. The combination of lightweight Hyaluronic Acid, Vitamins A, C, E, and Green Tea results in instantly in smoother-looking skin with reduced appearance of fine lines and wrinkles, better volume and increased firmness. Your skin will emerge deeply hydrated, balanced and glowing with vitality. Results are not only instant but continue to improve in the following days, in conjunction with continued use of at-home products. Series of 6 (includes home care products) $700. Our deep cleansing facial is designed to be the perfect balance of effective exfoliation and relaxation. We begin with a skin analysis of your specific skin type. Cleansing and customized exfoliation are implemented with steam. Extractions and a specialty masque are performed to remove any impurities in the skin. A relaxing neck and shoulder massage complete this treatment. This physician exclusive treatment is used to remove the outer most layers of the skin, leaving the skin immediately smooth, supple, and vibrant. Microplaning is combined with alpha hydroxy acid, freeing pores of impacted debris. Extractions and a calming masque complete this signature facial. Optional booster masks available, for an additional fee. Good habits start young! This cleansing and purifying facial is specifically designed to address persistent breakouts, leaving the skin balanced with reduced shine and refined pores. We will introduce your teen to the importance of good skin care habits and help them maintain healthier skin. SkinCeuticals facials when combined with appropriate homecare, professional facials offer signifiganct improvement in the health and appearance of skin. Sara, our Licensed Esthetician can select which facial is best suited based on skin concerns, including acne, aging, discoloration, and rosacea. This detoxifing treatment purges skin of impurities and rebalances congested skin resulting, in a clear glowing complexion. The enhanced restorative treatment will deliver a refined, radiant glow. Chemical peels are minimally invasive and deliver maximum results. We offer a variety from light, to medium, to deep. Chemical peels target dull skin, brown spots, and fine lines. The Perfect Peel penetrates deep into the skin and works from the inside to repair oxidant damage and even skin tone. This peel treats a wide variety of skin conditions that you’ve been covering with layers of makeup for years including fine lines, sun spots, deep enlarged pores, and dark circles under your eyes. Results can be seen after just one peel and continue to improve with each peel. This Glutathione Skin Peel is designed to be used every 2 to 3 months and can be used as often as once every 4 to 5 weeks. The treatment takes approximately 15 minutes, is virtually painless, and there is little social downtime. The Perfect Peel is a medical grade peel, and is only available to and sold to medical professionals. SkinCeuticals peels are an integral part of achieving optimal skin health and appearance. Tailored to specific skin types and conditions, these treatments are designed to target hyperpigmentation, aging, acne, and more. Peels also enhance the results of patients’ homecare regimens and other in-office procedures. Combining glycolic and lactic acids to exfoliate surface cells, reduce irritation, and hydrate the skin, Gel Peel GL revitalizes photo damaged skin by stimulating collagen synthesis and remodeling elastin. Formulated to address pore congestion, wrinkles, other signs of aging, and irritation, Gel Peel SM combines salicylic and mandelic acids to improve problematic skin and stimulates skin renewal. 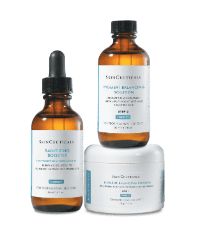 This SkinCeuticals peel is a customizable professional-only treatment that targets hyperpigmentation to dramatically improve photo damaged skin. This masque combines brightening and anti-inflammatory agents with a peeling acid solution to accelerate cell renewal and diminish surface discolorations. The Pigment Balancing Masque is best when done as a series of five treatments done every 10-14 days, but it can also be done as an individual treatment. Series of 3, $583. The micropeel Plus Peel is ideal for combination, oily, and acneic skin. Works to promote skins natural renewal process to aid in the reduction of acne, and to improve uneven texture, blotchiness, and uneven skin tone. Series of 3, $571. A medically exclusive peel for comprehensive texture refinement and improvement of discoloration. This peel features an exclusive blend of skin brightening and clinical-grade exfoliating ingredients, leaving the skin with a more even tone and texture. It is beneficial to anyone concerned with mild to moderate signs of aging, stubborn discoloration or uneven skin tone and texture. Light flaking to peeling typically occurs for 2-6 days and a series of 4-6 peels spaced out every 4 weeks is recommended for optimal results.Series of 3, $713.